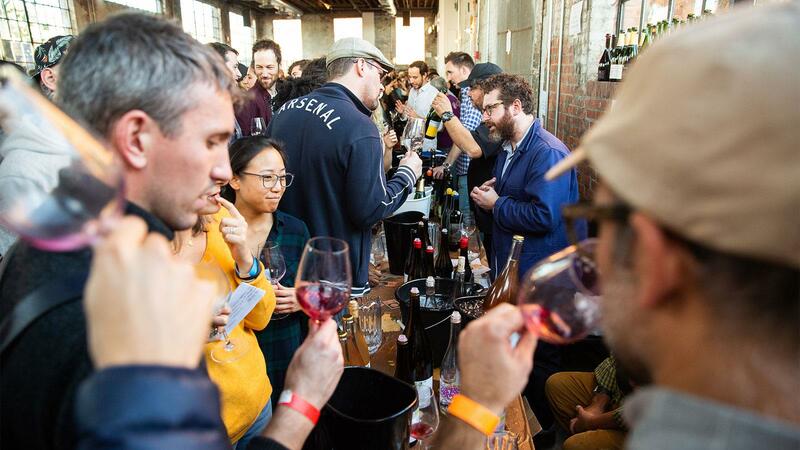 In Brooklyn, the Raw Wine fair attracted winemakers and fans from far and wide. In November, the Raw Wine fair, showcasing more than 140 producers from 15 countries, made stops in Montreal, Los Angeles and New York. I have attended the event for three consecutive years and have witnessed its growing attendance and improving quality in the selection of growers. About 2,000 people attended the Raw Wine fair in New York. Hosted in the hip Brooklyn neighborhood of Bushwick, the two-day event attracted industry professionals, press, young Brooklynites and other consumers. For those in the industry, the fair is about the community as much as the wines. Raw selects wineries according to explicit rules. In order to participate, growers must be certified organic or biodynamic. All grapes must be harvested by hand. In the cellar, yeast inoculation is not permitted, nor are additives such as yeast nutrients and enzymes to control fermentation. Reverse osmosis, sterile filtration and similar techniques are forbidden. Oregon's Swick winery was among the fair's stars. Raw is transparent: Each wine presented must indicate any use of sulfur or fining agents, and if chaptalization or acidification have been performed. Since natural wines still lack a formal definition, Raw’s parameters in a way serve as such. “It is interesting to see Isabelle defining natural wine,” said Mackenzie Hoffman, a sommelier at Scandinavian restaurant Aska, in Brooklyn. In certain cases, this means that a producer cannot present all of their wines at the fair. “I wished Isabelle broadened the guidelines to include all the wines that a producer makes, instead of judging by cuvée,” Hoffman lamented. Some producers, such as Gut Oggau of Austria and Frank Cornelissen of Sicily, are so popular that talking to them or even tasting their wines was almost impossible. While many wineries were relatively unknown in the U.S. market, others, such as Gravner and Radikon, have received classic scores from Wine Spectator. Apart from the aforementioned growers, my highlights included qvevri wines from the Republic of Georgia, like Gotsa Wines and Tibaani. Domaine de l’Ecu from the Loire and Fleury from Champagne also left an impression. Displaying beautiful pure wines in a range of styles were Austrian producers Meinklang, Claus Preisinger, Alexander Koppitsch, Matthias Hager, Johannes Zillinger, Michael Gindl and Maria & Sepp Muster. Among U.S. wines, Donkey & Goat and Maître de Chai from California, Swick from Oregon and Bloomer Creek from New York excelled. Some wines were more controversial—high in volatile acidity or brettanomyces, expressing funky notes. These are unpleasant to some people, while others embrace the unusual flavors. These so-called natural wines won’t please everyone, and their producers don’t really care. As Raw shows, they have built a community of supporters, and it's gathering in size and strength.